Go to the Home tab on the ribbon, click New Slide, and choose Graded Question or Survey Question. Go to the Slides tab on the ribbon and click Graded Question or Survey Question. In Story View, right-click anywhere in the workspace, scroll to New Slide, and choose Graded Question or Survey Question. In Slide View or Form View, right-click anywhere in the Scenes panel, scroll to New Slide, and choose Graded Question or Survey Question. When the Insert Slide window appears, use the search field at the top and the filters along the left edge to locate the question you want to add. The slide browser includes built-in templates as well as professionally-designed Content Library 360 templates. Choose from 11 types of graded questions and 9 types of ungraded survey questions. When you click a thumbnail image for a slide, the right side of the window shows a description of that question type. Click Insert Slide to add it to your project. Tip: You can insert multiple questions at the same time by holding down the Ctrl key or the Shift key while clicking thumbnail images. When you insert a question slide, it'll open in Form View. Type your question into the field at the top of the window and the answer choices below it. For many graded question types, you must also indicate which answer is correct—just select the radio button or check box for the correct response(s). 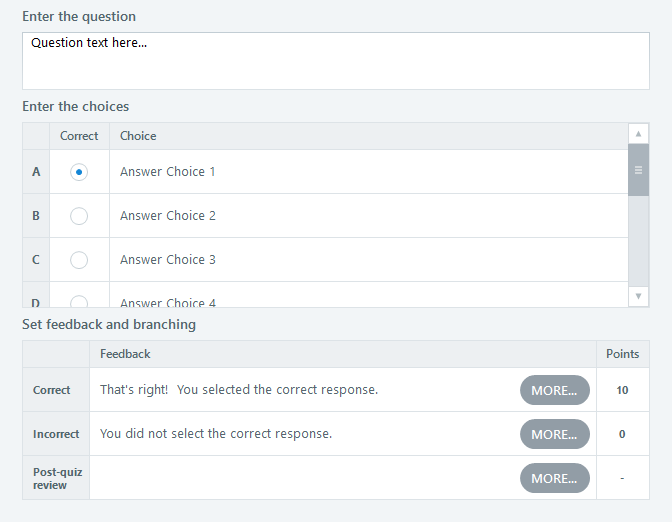 After inserting a form-based question, you can customize several of its attributes, including shuffling of answer choices, feedback, branching, score, and number of attempts. To learn how, see Working with the Question Editor.